WASHINGTON (June 22, 2016) - Lester Holt, the first solo African American evening anchor on a weekday network newscast, accepted the 2016 NABJ Journalist of the Year Award from the National Association of Black Journalists (NABJ) at an NBC reception at 30 Rockefeller Plaza in New York City last night. 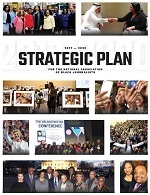 The award recognizes a black journalist who has distinguished himself or herself with a body of work that has extraordinary depth, scope and significance to people in the African Diaspora. After Holt accepted the award, he applauded NABJ for its commitment to diversity and inclusion over the past four decades and spoke of NBC News' newsgathering process. "Our diversity in newsrooms simply makes us better," said Holt. "When we sit in our editorial meetings every afternoon at 'Nightly News,' that diversity of race, culture and sexual identity - all of those things come into place when we start discussing news of the day and everybody can bring something to the table. That just simply makes us better journalists. 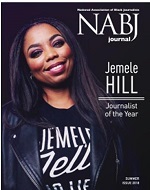 So, I want to applaud NABJ for what the organization continues to do, it's incredibly vital." Holt also discussed the people who came before him. He gave praise to Max Robinson, Carole Simpson, Bryant Gumbel and Bernard Shaw -- African American news anchors that broke color barriers at a time when it was uncommon to see broadcast journalists of color anchoring the news. "These are people that opened the doors for people like me to walk through" said Holt, "and therefore it's incumbent on all of us to remember that many of us are the products of great mentors." Holt anchors the "NBC Nightly News with Lester Holt." Since assuming the role of anchor, he has helped NBC Nightly News maintain its ranking as the most-watched evening news program. He also anchors "Dateline," the network's signature newsmagazine and longest-running show in primetime. Last spring, Holt traveled to Baltimore and provided an intimate look at the protests sparked by the death of Freddie Gray on April 19, 2015. He was also in New Orleans as the country commemorated the 10th anniversary of Hurricane Katrina and told stories of the storm's impact on the community. "He has done so much - the journalism excellence that he exudes day after day is the gold standard," said Sarah Glover, NABJ President. "We thank you, (Lester), for shining a light on great journalism and for leading the way." While Holt won’t be at the convention due to Olympics coverage, his achievements will be recognized at the Salute to Excellence Awards at the #NABJNAHJ16 Convention on Aug. 6. Stephen Burke, Chief Executive Officer, NBCUniversal who also attended the reception said Lester is "... the hardest working person in this building and maybe the hardest working person in television journalism." "He just brings people together," said David Corvo, senior executive producer of Dateline NBC. "I like him best when he's in the field reporting, being there for people. That's when the real nature of Lester shines through." The night ended with a performance by Lester's NBC band, the 30 Rockers, with Holt on bass. Their set list included "Gimme Shelter" by the Rolling Stones, Van Morrison's "Wild Night," "Lonely is the Night" by Billy Squier and "Jane" by Jefferson Starship.